Congratulations Re-Play for your delicious buck burgers! While they are many great choices for these tasty treats in the Green Bay area, the voters have spoken. And the GBNightLife.com staff couldn’t agree more. If you’re on the lookout for a buck burger, check out all our reviews, we can point you in the right direction. GBNightLife.com is proud to present, drum roll please, Buck Burger Time. Green Bay is full of them; it's almost fair to say everyday of the week there's a place grilling up one of American's favorite pastimes. The staff at GBNightLife had the difficult task of bustling around town in search of the best buck burger out there. It was so difficult that sometimes we had to try it twice – just to make sure, of course. So here's the deal. Every day of the upcoming week, we will release what bar/restaurant has a buck burger waiting for you to try alongside our own review of the burger. Get your appetite ready and try a burger. Then come back to our home page and cast your vote. Maybe you already know what dollar burger places are out there, then let us know by voting too. Anyone can comment below. Loved a place? We can't wait to hear about it. Loved it not so much, well, we still want to hear about it. The voting will be open for one week only. So cast your vote and let your favorite buck burger place get the prestigious award of being the fan favorite. Disclaimer: Buck burger fever is contagious. Once you have a tasty dollar burger you can never go back. Luckily, there are quite a few establishments around Green Bay to satisfy the cravings of "buck burger hunger." There will be two Best Buck Burger winners, one crowned by GBNightLife.com and one by voter's choice. Patricia: Hilltop Cafe is located in a gas station just off the highway on Bay Settlement Rd. They have buck burgers on Wednesdays, Saturdays, and Sundays. You are required to order a side with this buck burger and their style is a bit more self service. Cheese costs extra. You order at the counter and when they have a condiment buffet to add your own, ketchup, mustard, pickles, and onions. This burger was larger than the average with a fluffy bun. It was flame grilled and you could taste the flames on it. The meat tasted better than average. GBNightLife Staff: OK burger, wasn't a fan of the bun. Burger patty seemed bigger than average. Enjoyed the fact that you can add your own condiments. Patricia: On Mondays starting at 11:00am the Abbey in D ePere offers dollar burgers. If you want fried onions it will cost and extra 29 cents or if you want a slice of American cheese it will cost and extra 39cents. The beef patty was thin but had a nice seasoned flavor and was flame grilled, it was served on a thick freshly toasted and lightly buttered bun with nice size fried onions, the pickle slices on the side were of a better quality kosher style. GBNightLife Staff: This was pretty good for a buck! Patricia: Monday night starting at 7:00pm Anduzzi's offers burgers for a dollar and if you want a slice of American cheese, it will cost you an extra 50 cents. I asked if I could order fried onions on the burger even if I paid extra and I was told that they will not do that for the dollar burgers, but dill pickle slices and raw onion come with the burger. My burger was a nice 6oz patty on a large plain toasted bun (no butter) with some pieces of raw red onion on the side with a few dill pickle slices. The meat patty had a nice flavor to it and the bun was nothing above average. GBNightLife Staff: Definitely bigger than some of the others, however not the most memorable burger, but they do have $1 domestic pints so if you're looking for a deal you might have found it. Patricia: Kimmer's bar has $1 burgers on Mondays starting at 2pm. For a slice of cheese they charge only 25 cents and 25 cents extra for pickles, tomato slice and lettuce. I ordered my burger with pickles and fried onions. The burger consisted of a small beef patty on a very fresh soft hamburger bun with dill hamburger sliced pickles on the side. The hamburger patty had a very good flavor and was very juicy, the kind of flavor you can only get from a very well seasoned grill. The pickles were very tart and their was a fair amount of fried onions on the burger. GBNightLife Staff: These were some of the smaller sized burgers we had, but they still beat some of their competitors. Reminiscent of a good old regular McDonald's hamburger. We would eat it again. Patricia: I went to the Ravine to try their dollar burger which they offer on Mondays. They say it is a 6oz beef patty and if you want a slice of cheese on it would cost 50 cents extra, fried onions are free and lettuce, tomato, or mayo would each cost ad extra .25 cents. My burger came on a toasted buttered bun but I would say the patty was closer to 4 ounces; it was juicy and with my fried onions tasted pretty good for only a dollar. 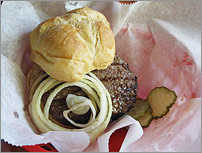 Patricia: From 11am to 10pm on Monday's the Rite Place (on Bellevue and Lime Kiln) has their buck burgers. They require purchase of a beverage and cheese is an extra quarter, however fried or raw onions are free. This burger had a little butter smeared on the top bun, but the bun was cold and not high on the delicious scale. The patty itself was average in size on a buck burger scale and had a noticeably salty flavor. Although the patty wasn't cold, the cheese didn't melt on top. GBNightLife Staff: This was indeed a salty little guy, we all commented that we could still taste it after we left. Those of you who are heavy salters may enjoy this one. Patricia: Shaker's bar in West De Pere also offers dollar burgers on Mondays starting at 11:00 am. On their burgers fried onions are free and it will cost an extra 25 cents for a slice of cheese, the choices are American, Cheddar, Swiss, or Provolone. Now this burger is a whopper of a beef patty; it looked hand formed and was definitely over a third pound, it was thick and the patty hung over the soft medium sized bun. There was a good amount of fried onions but the beef patty could have used a bit more seasoning. The pickle slices on the side were the hamburger dill variety. GBNightLife Staff: A bun can make or break a burger and when we're discussing $1 burgers choices make a difference too. This one may not have had the best buger seasoning, but they did have several cheese options. Patricia: Starting at 8:00pm Willow Creek Lanes also offers dollar burgers on Monday nights. You can also order it with a slice of American cheese for an extra 50 cents and they do not offer fried onions. My burger consisted of a small fried patty on a plain soft white bun no butter with a few dill pickle slices on the side. The bun was very fresh, it tasted like a Mrs. Karl's bun. The patty had a nice seasoning and together it tasted pretty good. 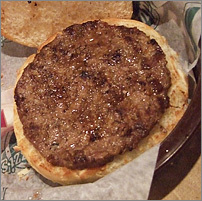 GBNightLife Staff: This did not look like an appetizing burger. All of us had set our expectations very low when this one came out, but it did taste better than it looked. It had a soft bun and the patty did not taste bad. Patricia: Archie's Pub and Grill offers dollar burgers on Tuesday nights. For an extra 50 cents you can add cheese - they have a choice of cheddar, pepper jack, American, or mozzarella, and raw or fried onions with dill pickle hamburgers slices are free. 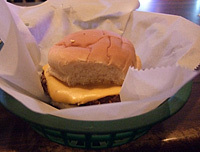 The beef patty was 1/4 pound served on a large fresh hard roll which was toasted with melted butter on it. 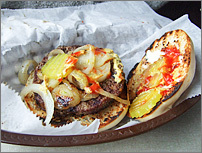 The hamburger meat was grilled and moist with a nice flavor the whole sandwich was delicious. GBNightLife Staff: Good flavor, would go back if we were in the neighborhood. Patricia: Keweenaw's which is located in West De Pere has dollar burgers on Wednesdays. For an extra 25 cents you can get an American slice of cheese and onions are free. The burger was a good 4oz patty that was grilled then put on a large white very lightly buttered bun, I ordered my hamburger with fried onions and they put on a fair amount. The whole hamburger put together had a good flavor but the bun was not toasted or grilled. GBNightLife Staff: One of the better ones, not much to complain about here with a fairly good flavor. Patricia: Cliffhangers offer $1 burgers with the purchase of a beverage on Thursdays. They offer a large selection of choices to add to your dollar burger. For 25 cents extra you have a choice of Cheddar, Swiss, Provolone, Pepper Jack, or Blue Cheese crumbles. They also have a selection of tomato, lettuce, jalapenos, sauteed mushrooms, and fried onions for an additional 25 cents each, you can also add bacon for 75 cents. If you would like some sauce put on your burger for another 25 cents the choices are mayo, BBQ sauce, buffalo sauce, blue cheese dressing, ranch, southwest ranch. The hamburger patty was a 1/3 pound the side of fried onions and saut�ed mushrooms that I ordered were on the skimpy side and the bun was plain. My hamburger was a good size and with the most choices offered, it had a good flavor but not mouthwatering. GBNightLife Staff: One of the biggest burgers and all those add on options bumps this burger up on our list, however the add ons couldn't cover up the fact that some of the burger patties were a little on the dry side. Patricia: On Thursdays Half Time bar offers dollar burgers. It is located on the East side of Green Bay on University Street. I ordered mine with fried onions which were free but if you wanted a slice of American cheese it would cost an extra 25 cents. The bun was buttered and grilled nicely with a good amount of fried onions and the beef patty was a good 1/3 pound but tasted on the bland side. GBNightLife Staff: Decent dollar burger, if you order American cheese on top, it really adds to the flavor. Patricia: They offer dollar hamburgers any day of the week at Goal Post which is located in Bellevue. You must order a side like French fries or Onion rings at normal price to be able to purchase the dollar burger. The burger patty was small on a soft buttered bun and my fried onions were diced, the beef patty was of a poor quality and had a flavor of liver to it. If you wanted a slice of American cheese they charge 50 cents extra. GBNightLife Staff: Probably not the best buck burger around, the meat just wasn't that good. Patricia: Re-Play is located in De Pere and offers dollar burgers on Saturdays & Wednesdays. The burger was a good 1/3 lb. and came on a delicious fresh dense bun that was buttered and nicely grilled. 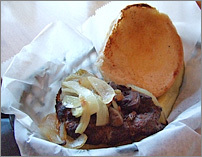 The beef patty had a great flavor and was cooked on a well seasoned grill with plenty of fried onions. The hamburger had a delicious buttery flavor to it. If you wanted American cheese on your burger the cost would be an extra 25 cents. GBNightLife Staff: This one was pretty delicious and a decent size. I'd go back for the burger even if it wasn't a $1.00. Toasted bun and a good flavor. GBNightLife Staff: This one was above par, a little buttery and perhaps a little greasier than some.